The Cambridge University Collection of Aerial Photography (CUCAP) is the result of airborne survey campaigns which were started in 1947 by the pioneering JK St Joseph. Since then the collection has grown to almost 500,000 images of obliques and verticals in black and white, colour and infra-red. Virtually the whole of Britain has been covered, with the obliques depicting a wide variety of landscapes and features and the verticals being of survey quality, can be used in mapping projects. 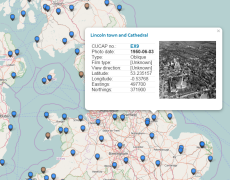 Some of the uses of CUCAP images include archaeology, geology, social history, law (land/border disputes), environmental issues (coastal erosion), planning as well as general interest. Explore some of the very best images in the collection. The Collection is currently closed although you may contact us to register an interest in particular imagery. A restricted number of medium resolution jpegs from the Collection are available for download through the Cambridge University Digital Library website under a Creative Commons (CC-BY-NC) license. We are, however, currently unable to deal with requests for high-resolution versions of these images for publication, other than for press purposes. Please contact us if you have an urgent enquiry.